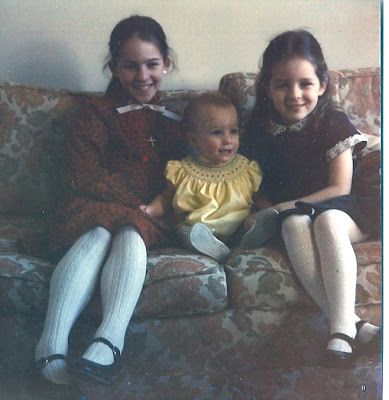 Three Sisterz: Merry Christmas from Three Sisterz! Merry Christmas from Three Sisterz! It's gonna be a Three Sisterz Christmas in Philadelphia this year. Flannery and Molly are on their way RIGHT NOW with their families in tow! Our parents are coming tomorrow morning. We are looking forward to an even better year in 2011! Wow! We've got some new recipes to try. ***Mom always had us dressed up. So cute!! I wish I still had all my smocked dresses! My great Aunt was in the conveant at St Joseph's and all my dresses were made by the nuns....they are so lovely ;) Merry Christmas ladies...such a joy coming to "work" every morning with yall ! What beautiful little ladies! Oh wait--that's another blog! LOL Anyhow, this is so sweet. Best to you all!